The first Christmas card was done in 1843 in London and had a picture of a family raising a toast. In 1843 those cards were sold for a shilling each. When one went to auction in 2001, it sold for 22,000 pounds. Although there has been a decline in sending of Christmas cards a large amount are still currently sold. In 2008, around 668 million cards were sold in the UK, this adds up to half the greeting cards sold that year in the UK. In the US they have had around a 25% drop in the mail over Christmas of cards since 2006. But Americans still managed to send 1.9 billion cards in 2005. The White House started sending out Christmas cards in 1953 with President Eisenhower and the list was 2,000 people. Now the White House sends out more than 1.4 million. Christmas cards are very collectable and Queen Mary collected a large collection that is in the British Museum. Whether sending a traditional posted Christmas card or an e-card, I don’t think they will ever go out of fashion. With families and friends so far away from each other, sending a special greeting to let them know you are thinking of them is an important part of Christmas. Christmas letters are an added extra to the annual Christmas cards. In the UK, they are called Round Robin letters. So many people talk about how much they hate them. They write books about how bad that they are. Unlike those Christmas letters, there were a few special Christmas letters written in 1914. 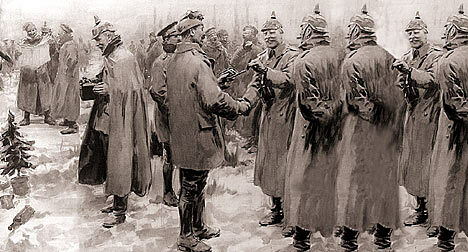 On Christmas Eve in 1914, an informal ceasefire was organised on the Western Front. That Christmas Eve the soldiers sang songs, exchanged gifts and had a soccer match. Many soldiers wrote Christmas letters home and surprisingly many wrote how they didn’t agree with having a ceasefire. The reason that the annual Christmas letters are hated so much is the bragging about how great your year has been. But I bet those soldiers would be happy to receive one of those annual Christmas letters to hear that what they fought for was worth it. Christmas family letters are a real tradition in some families and the State Library of NSW holds letters spanning more than 100 years. Covering soldiers in war hoping to come home for Christmas and a family that have 40 years of Christmas letters they have contributed. After writing this blog, I hope to receive many a Christmas tiding. I will lovingly put them all up for the Christmas season, right next to the three dozen cards my kids have collected from kids at school and Kindy. Why you ask do they have so many? To covertly swap lollies. I spend a dollar on cheap cards that will be ripped out of the envelope so I can help my kids pass on their Christmas greeting by lolly. It’s a Christmas card tradition that I’m hoping they will grow out of. Christmas Greetings to you and I hope many an interesting Christmas letter and Christmas card comes your way for you to enjoy and know that you are thought about through the year. Comment about what you like about receiving Christmas cards and letters. Do you love it or hate it? Christmas cards, Christmas Eve 1914, Christmas letters, State Library of NSW, World War One. Bookmark.